YoGems Badminton Championship 2018 finally marks its end on Tuesday. The digital scoring oriented city’s first ‘Paperless’ Badminton Tournament received participation of approx 550 students from 150+ schools of Chandigarh region. All the matches of the tournament were played in between October 6 to October 9 in Badminton Hall, Sports Complex, Sector 7, Chandigarh. 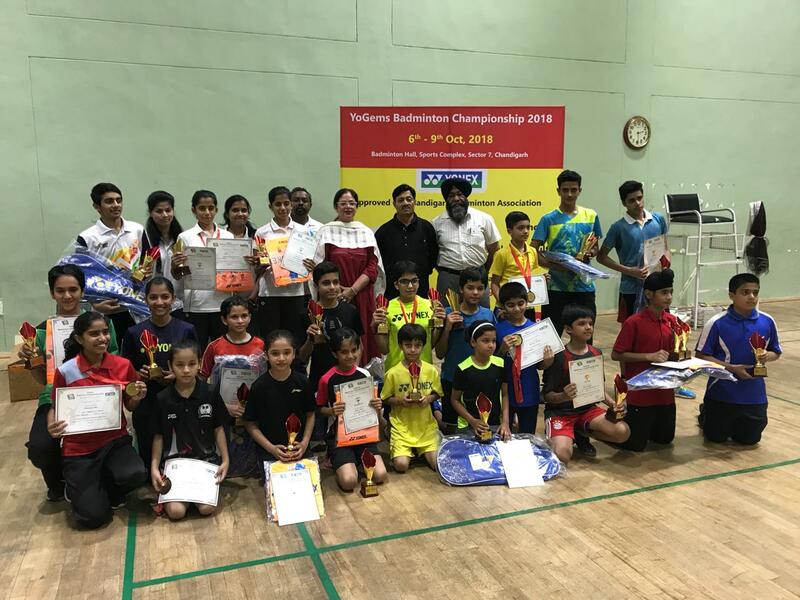 Both Boys and Girls matches in Singles and Doubles categories were played in Under 11, Under 13, Under 15 and Under 17 age categories during the course of 4 days tournament. All categories semifinal and final matches were played on the last day of the Badminton Championship. Former Indian Badminton Player and Arjuna Award winner Kanwal Thakar Singh and National Badminton Coach and Secretary of Chandigarh Badminton Association Surinder Mahajan were the chief guest of the closing ceremony. Kanwal Singh, Surinder Mahajan along with YoGems CEO Damnish Kumar honored all categories winners and runner-up with medals and certificates. In Girls Doubles U15 final match Rijul Saini and Shagunpreet Kaur grabbed the winning trophy with 21-18, 21-19 points win against pair of Tisha and Tanisha. In Boys Doubles U15 final match Arjun Prakash and Ashwin Puri wins close battle against Adhiraj Jain and Udayveer with 23-21, 23-21 scoreline. Boys Doubles U17 category final witnessed high voltage match between pair of Ytharth Madaan and Gurbaksh Saini against pair of Aryan Dhaneshwar and Sanyam Grover. Ytharth and Gurbaksh Saini clinched the winning trophy in end with 15-21, 21-14, 21-18 scoreline. In the semifinal match of Girls U11 age category Bhakti Bhakti progresses towards final with easy win of 21-8, 21-5 against Ananya. Sarah Mohan wins match against Tanishka Nandal in other semifinal match of Girls U11 age category with 21-19, 21-6 scoreline. In Boys U17 semifinal battle Akash Grewal wins ticket to final Sarthak Garg with 21-13, 21-12 scoreline. Gurubaksh Saini wins match against Aman Singh in the other semifinal of Boys U17 category with 21-17, 21-14 scoreline. In the final match of Girls Doubles U13 Rijul Saini and Shagunpreet Kaur tastes victory against Rakshita and Gurmannat Sandhu with 22-20, 21-8 points. In the final match of Boys Doubles U13 category Atishya Saxena and Piyush Chauhan wins comfortable match against Ishmeet Singh and Ayushman Bhati with 21-12, 21-17 scoreline. Semifinal matches of Girls U17 Singles category named Vrinda Rana winner against Shagunpreet kaur with 21-13, 21-16 scoreline. In other match Himanshi Dhingra wins match against Nimanpreet with 21-17, 21-17 points. In Boys U13 category Singles Semifinal match Mrinank Sharma wins against Ishmeet Singh with 21-7 ,21-16 scoreline. In other encounter Piyush Chauhan wins match against Abhiroop Sarkar with 21-15, 21-14 points. In Girls U13 semifinal matches Shagunpreet Kaur defeats Ruchi Chahal with 21-11. 21-10 points and Rijul Saini defeats Tanu Malik with 21-9, 21-14 scoreline. In Boys U15 semifinal matches Arjun Prakash defeats Udayveer with 21-9, 21-10 points and Pratham Sangwan wins match against Aaditya with 21-16, 21-16 points. In U9 Boys Singles semifinal matches Ayaan Singla wins against Ans Khare with 21-5, 21-4 and Arjun Mohan wins against Aayan Jagdev with 21-17, 12-21, 21-15 scoreline. In final match of Girls U11 category Bhakti Bhakti announced the winner against Sarah Mohan with 21-11, 22-20 scoreline. Mrinank Sharma wins Boys U11 category final against Piyush Chauhan with 21-16, 21-17 points. Pratham Sangwan wins Boys U15 category final against Arjun Prakash with 21-17, 21-15 scoreline. Vrinda Rana wins Girls U17 category final against Himanshi Dhingra with 21-19, 18-21, 21-15 points. In Boys U 9 age category Ayaan Singla grabs winning trophy after defeating Arjun Mohan with 21-14 ,21-13 points. In girls U9 category final Ridhima Saini wins match against Khushdeep Kaur with 21-14 ,21-14. Shagunpreet Kaur wins final match of Girls Under 15 category against Muskan Sharma with 21-11, 21-15 points. In final match of Boys Single Under 17 age category Akash Grewal wins final match against Gurubaksh Saini with 21-15, 21-17 scoreline. Shagunpreet Kaur was named as the ‘Player Of The Tournament’ of YoGems Badminton Championship 2018.